Lets face it, men like to be pampered just as mush as women. For most of us the best opportunity to receive our pampering is during grooming routines, such as a visit to the barber. Well, what if there were to be a place that offered the traditional elements of an upscale barbershop, retained an affinity towards maintaining a male-friendly atmosphere and at the same time offered the grooming services that many times we sought alternative locations for? 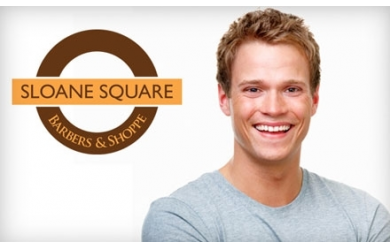 Being that this is Sloane Square this haircut includes professional styling, shampoo, conditioning, straight razor neck shave, hot towel, shoulder massage and the beverage of your choice. Now that is definitely the way to get a hair cut. May Buy 2 Per Person. May Buy Up to 1 as Gifts. By Appointment. Expires in 6 Months. Coral Gables Location Only.